On November 30, 2011, Nightwish released their most ambitious album to date. Imaginaerum was a sprawling, symphonic metal epic bolstered by live chorale and orchestral arrangements that showcased founder Tuomas Holopainen’s compositional skills as well as then-singer Anette Olzon’s vocal talents. It went soaring to the top of the Finnish Album Chart and earned the Finnish band a top three placing in the UK Rock Chart. However, the accompanying movie of the same name fared less well and disappeared with little trace, losing the band a significant sum of money in the process. 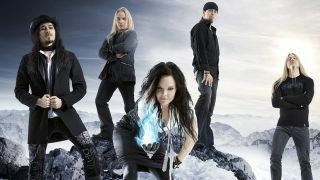 Although no one realised at the time, it would be Anette’s last album with Nightwish. She was replaced by After Forever’s Floor Jansen the following year during a tour schedule that would nearly destroy drummer Jukka Nevalainen. In an extract from an interview, originally published as part of Metal Hammer’s exclusive Nightwish supplement in issue 225, Tuomas and Anette discuss the ideas behind Imaginaerum and why bigger is better. The concept behind Nightwish’s new album, Imaginaerum, is an old man reminiscing about his days as a musician. Is there anything autobiographical about that? Are you trying to say the last 15 years have felt like three decades? Imaginaerum must be the most daring thing that Nightwish has ever attempted. There must have times when you thought you’d bitten off a lot more than you could chew? It sounds as though you are constantly in search of something bigger and more spectacular than what’s gone before? It’s necessary for Nightwish to outdo themselves – go to that next level of grandiosity – at every point, time after time? Did everybody in the group agree? Was it a unanimous decision? You have streamlined the content of the songs in order to make the movie hang together. It’s now about an old man on his deathbed who glimpses a childhood dream in which he refuses to grow old, and fights ageing with his imagination. All of this is no great surprise. After all, the band’s music has always had cinematic scope and you have spoken many times of your hopes to score a movie in later, post-Nightwish, years? As an individual, you have a great love of the classic Walt Disney flicks. You’ve cited the surrealist painter Salvador Dalí, film score legend Ennio Morricone and Tim Burton, whose quirky films include Edward Scissorhands, Alice In Wonderland and Charlie And The Chocolate Factory as other personal heroes. What do you admire about these people? How have they influenced you? The public perception of Nightwish isn’t necessarily true. Does the band appear in the film? At a pre-release playback of Imaginaerum, which took place for the benefit of the media in London, the band’s orchestrator, Pip Williams, described the album as “Tuomas’s masterpiece”. Do you agree that it’s deeper and perhaps a little less accessible than Dark Passion Play? So does it bother you if there isn’t a song as instant or ultra-commercial as the last album’s Bye Bye Beautiful or Amaranth? Can you talk us through Pip Williams’ role? He’s been with the band for three albums, recording the choirs and orchestras and helping to perfect the scores, from the final Tarja-fronted release, Once, onwards. Why is the Englishman so important to what Nightwish does? In some ways has Pip become too invaluable? For instance, when Nightwish play live his recordings of the choirs and orchestras are sampled to enhance the heaviness and sense of drama of certain tracks. Some critics have called this ‘cheating’ for want of a better word, because not everything is being played by the band. There are some people who do…? It’s simply about offering the best audio experience possible? Does some small part of you long to make a more simple record than Imaginaerum? You don’t make it particularly easy for yourselves, do you?